It’s also common for them to have over and under bites which sets them up for abnormal dental wear if left untreated. The most common cause of death is improper dental care. When the teeth are not taken care of they can’t chew their food properly and that can cause intestinal blockages. Miniatures are also prone to sinus infections because of the teeth being overcrowded. If sinus drainage becomes a problem you’ll notice the eye tearing up on the affected side along with facial swelling below the eye. sweet feed or high amounts of alfalfa is one of the worst things you could do. Now I know some people will say I feed my mini alfalfa and have not had a problem. Ever heard of the straw that broke the camels back? 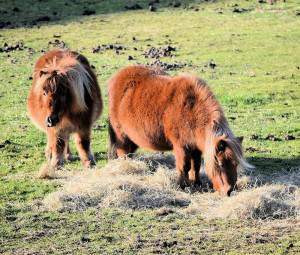 A feeding guide for miniatures is approximately 1.5% of their body weight in hay daily (200lbs = 3 pounds of hay per day). If you’re showing them or they are in foal they will require more hay (3% of their body weight). It’s best to avoid coarse hay because it’s hard on their digestive system. Don’t feed them any grain hays at all (barley, wheat, oat or rye). If you feed alfalfa only do 10% of their diet and no more. Don’t guess at their weight as most people tend to under estimate their body weight. Instead use a weight tape to get close. die because of the lack of blood flow. The coffin bone rotates and causes a lot of pain. This can be caused from, but not limited to turning them out on lush grass, but also from giving them high amounts of grain. I always caution miniature horse owners about worming and vaccinations. I usually don’t use chemical wormers and if I do it’s Safeguard. I highly recommend you stay away from Quest or Ivermectin as I feel there are too many side effects with these wormers. My first choice is to use either Herbal Tonic or NHD Wormer. If you have a miniature that you just rescued or you have no clue about how well they were cared for be careful using a strong wormer. If the miniature is over loaded with parasites and you use a strong wormer it could cause colic among other problems. Start out with with Safeguard if you insist on using a chemical wormer. On vaccinations my recommendation is to use Nosodes I get mine from Dr. Gerald Wessner, DVM. If you’re determined to vaccinate your miniature make sure they are healthy. Read the vaccination label, the first thing it says is “For Vaccination of healthy horses”. 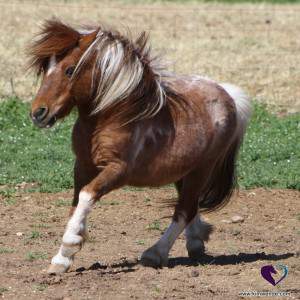 A miniature with laminitis, pneumonia, strangles, WNV etc is not healthy! 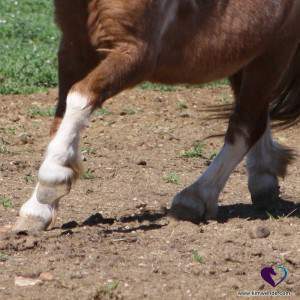 Make sure you get a farrier that knows how to trim a foot for balance…..Remember “No Hoof No Horse”. Grooming is very important for miniatures especially in the winter because they grow a lot more hair than a full sized horse. They can get a lot of things trapped in the heavy hair coat. Your miniature horse can live a long healthy life and a lot of potential problems can be avoided by providing the proper care and feeding they require. I have a mini mare (Emily) that has heaves. I’m also holistic oriented (dr Gerald Wessner for past 18 yes). Have tried Respi-free but didn’t seem to be helping adequately. Resorted to steroids which helped a little. But don’t want to do more of that. Don’t know where else to look as Dr Wessner is not available at this time. Breaks my heArt to see her struggle to breath. Anything you suggest for me to try? Greatly appreciated. Yes, I highly recommend Mo Lung it’s a pelleted herbal product that worked great for my pony mare she had heaves. If you’re interested let me know I can get you some ordered.